At coordinates R.A. = 10h 43m 53s, Decl. 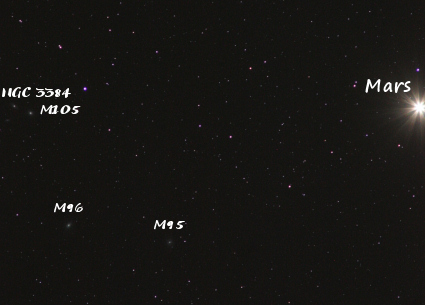 = +11º 40′ 17″ and magnitude around 13 yesterday I could spot and record with DSLR camera the M95 supernova. This picture was taken through a 300mm telephoto lens on an EQ6 equatorial mount w/o autoguider. The field was illuminated by a near bright planet, Mars, that became quite useful to locate the event in the sky. 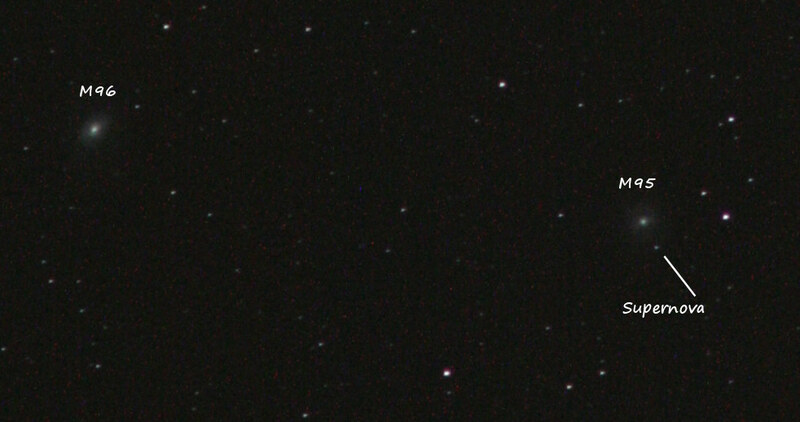 This entry was posted on 2012/03/25 at 5:41 pm and is filed under Astrophotography. You can follow any responses to this entry through the RSS 2.0 feed. You can leave a response, or trackback from your own site.